The hike around Mt. 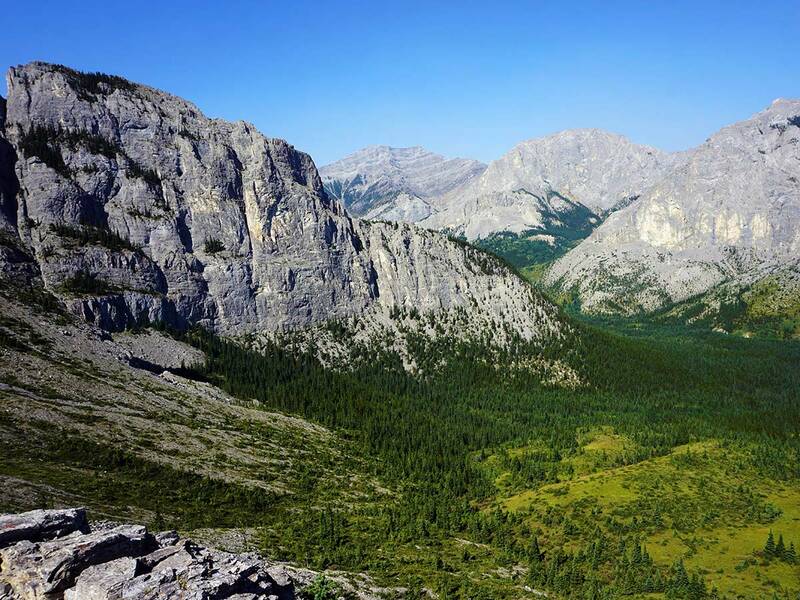 Yamnuska is one of Canmore’s favourite hikes. Hiking to Mt. 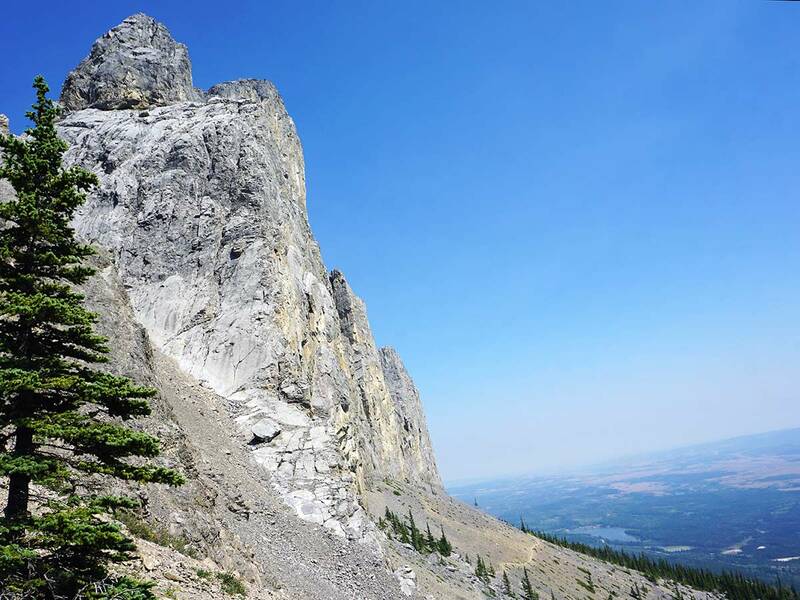 Yamnuska has wonderful views and this is a great hiking trail. But be warned, the chains section is terrifying for many! Head east from Canmore on the Trans-Canada Hwy for roughly 24.5km. 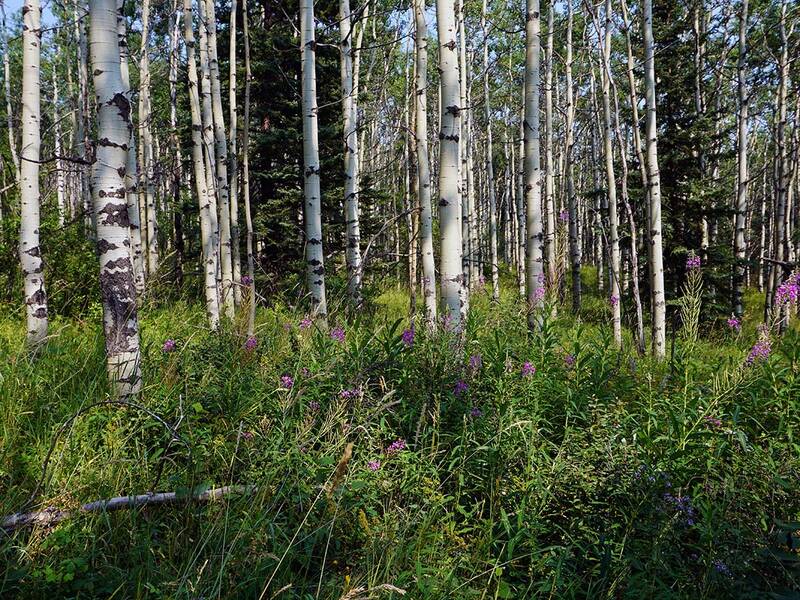 Take the Seebe turn-off that takes you to the 1A (this turn-off is 4.0km before the Stoney Nakoda Resort and Casino). When you come to a T-junction with the 1A highway, turn right and follow this road for 2.1km and take a signed left for “Yamnuska”. Park in the parking lot. 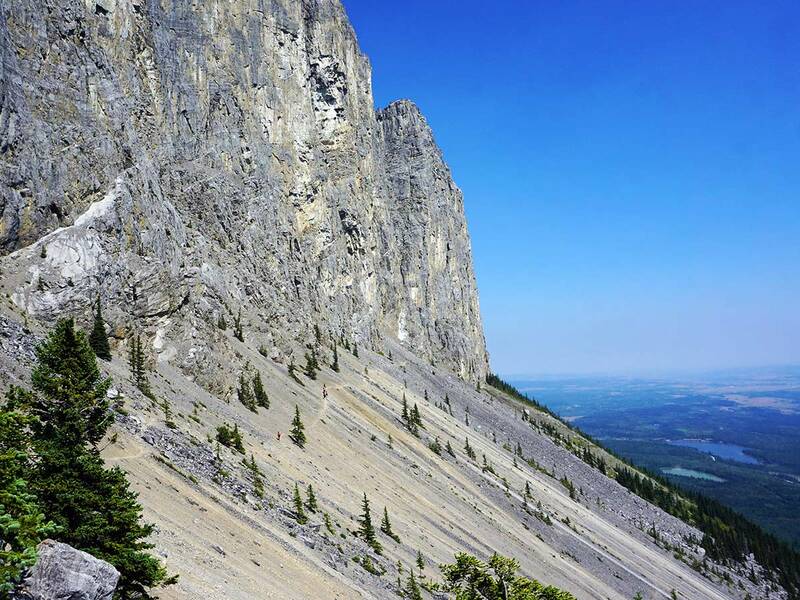 The Yamnuska Traverse is scary! For some people that is. The reason is that there is a section of chains that gets people sweating, crying and/or shaking. With that said, for others this section is the easiest thing in the world. On our recent hike in 2017, there was a line-up for the chains, with people going very, very slow. Even one of our contributors was involuntarily shaking at the end of the chains, saying he wouldn’t do it again without a harness and short-rope. Others find the chains very mellow, and not concerning at all. 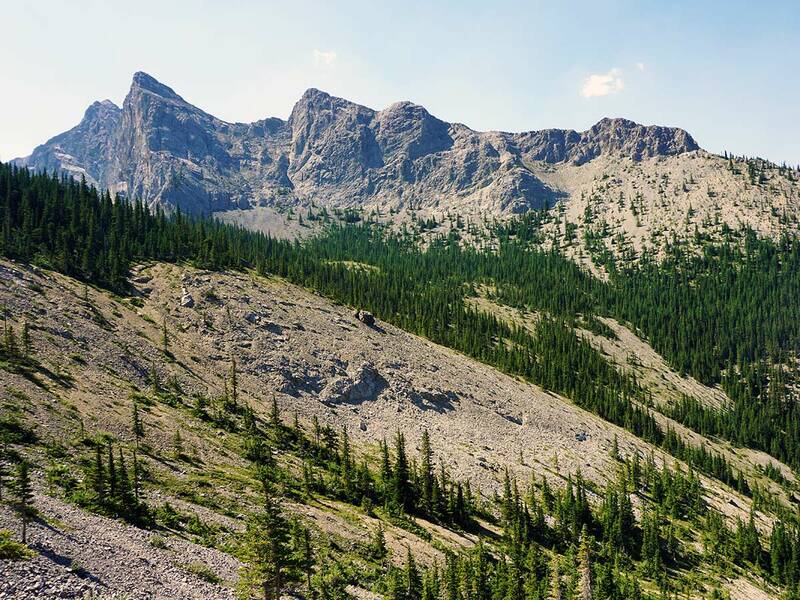 Whether you love or hate the Chains on Mount Yamnuska comes down to how you feel about exposure: you’re going to hate the chains on Yamnuska if you hate exposure. Now, for the details of the hike. Start from parking lot and go on a clear path by a sign. This hiking trail snakes through woods for 15 minutes before it comes to a split in the trail, where hikers go right. 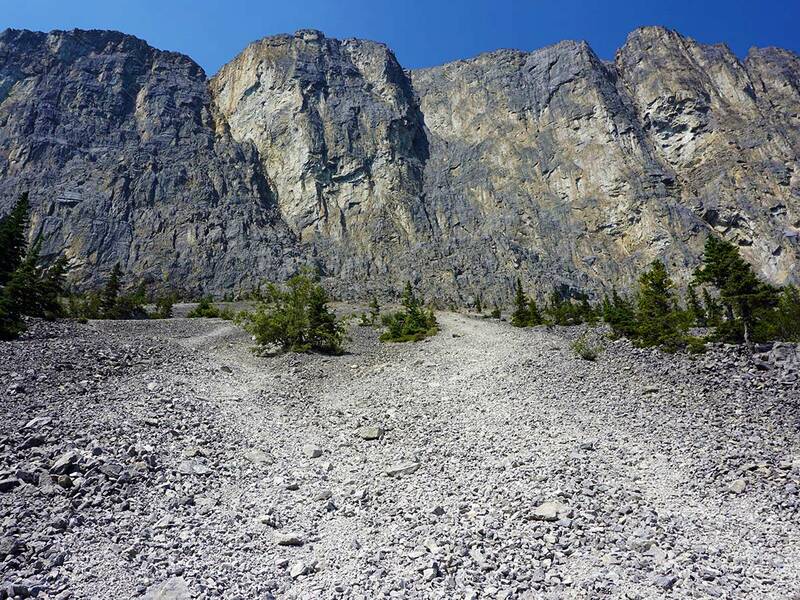 After 2.6km of hiking the flanks of Yamnuska (Yam for short), watch for an arrow made from rocks on your path. Go left at this point, heading uphill. You are now heading back towards Yam. Soon afterwards, the path splits again. At this split go right, heading uphill. Do not go straight along a path towards the edge of a cliff. When you get to the base of the Yam face the path looks blocked. This is a turn-around point for a lot of people who just want to get to this viewpoint. 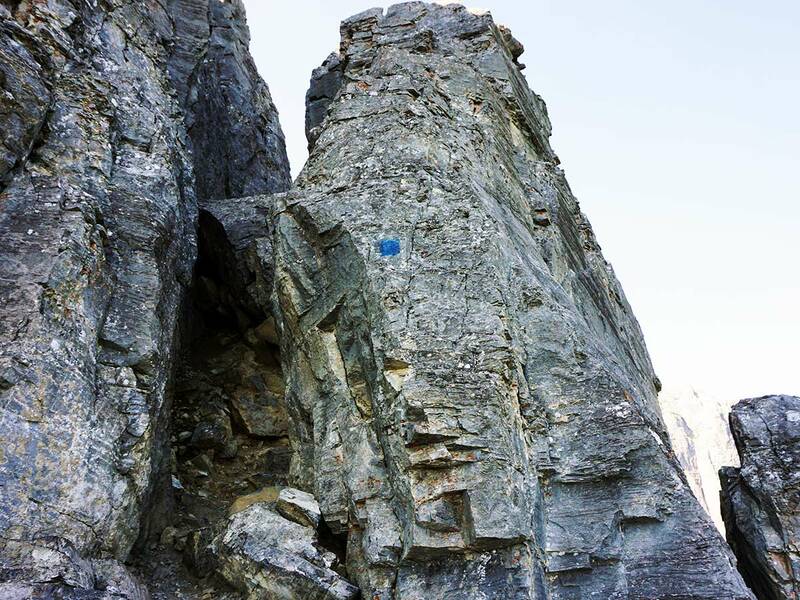 Instead of stopping at this point, follow the blue squares through a path that takes you through a seam in the rock. You’ll need to use your hands to get up occasionally. Coming through the rock seam you are rewarded with an incredible view. The scenery here is totally different from start of the walk and the Bow Valley. Take the path that contours around the mountain following blue squares. Do not take the path you can see heading up, dead ahead. Your path takes you to another break on the mountain rock you must get through, where you may also need your hands to get up. 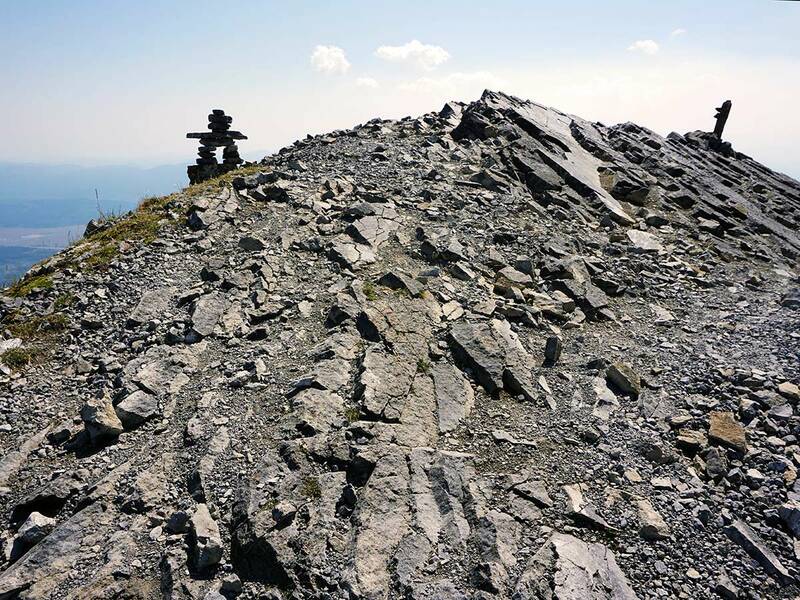 From here, follow a rocky path that goes up crossing little bits of scree until you reach THE CHAINS at 4.7km. You’ll likely be in a line-up on the chains, as people tend to go one-at-a-time and very slowly. Some people say the chains are easy, and we regularly see people breeze through this. On the other hand, we’ve seen people go very slowly, lock-up or end up crying from doing this. On of our contributors was shaking for 5 minutes afterwards. The next two hikers also sat down shaking from this ordeal. That said a group in front breezed over this laughing. For the Chains, if you don’t like exposure you’ll hate this. There are places where the path is so narrow you’re only on it with your toes. While the chains are the crux, they don’t mean the hard part of the hike is over. Right after the chains there is a challenging route up and down a steep rock band. 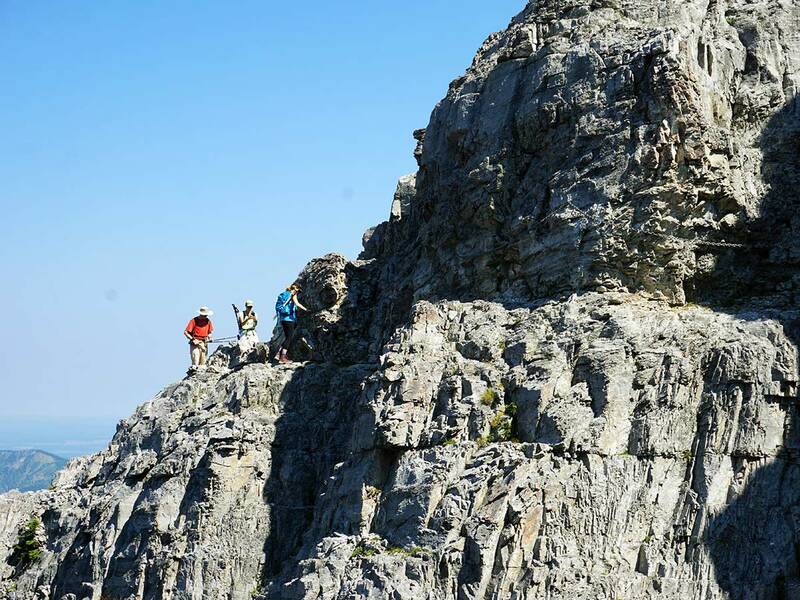 Keep hiking on this path until you reach the summit of Mt. Yamnuska. There are great views from here, but to be honest all the hiking today above treeline gives great and changing views. From here you can see the route down through the browny-orange scree. 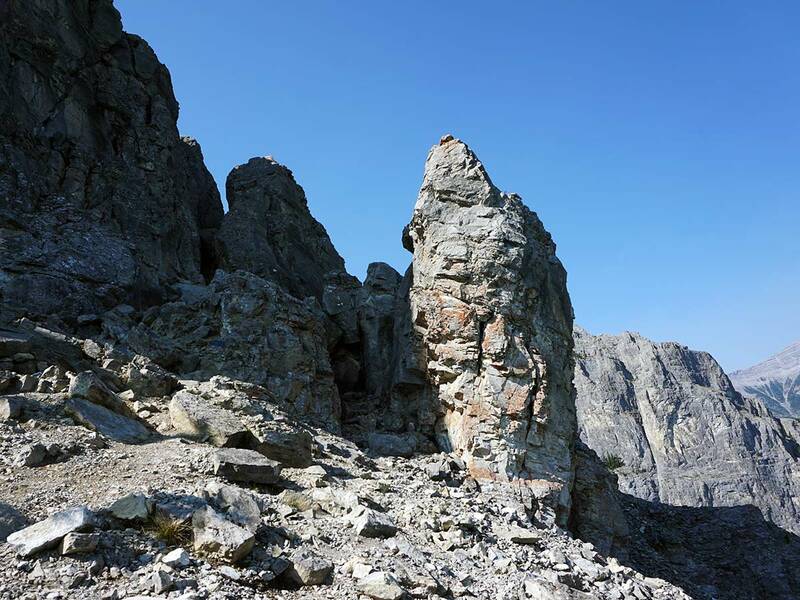 To get down, search out the soft scree to the right and enjoy some easy scree skiing and quickly get down this route. 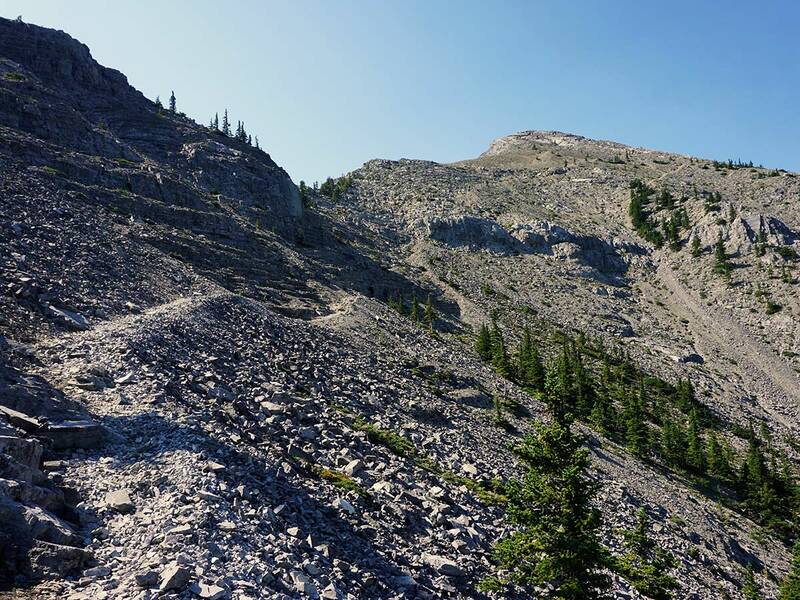 As a tip for easy scree descents: lean back and dig your heels in with each step. You will slide / step down the route. Be prepared to sit down at any time while doing this, as you don’t want to fall over face-first, as that would be very dangerous. Scree-skiing works well with small, deep scree. It is impossible in bigger boulders or if the scree isn’t deep enough. Poles really help! Going down here, the path splits. Both trails go to the same place, but the left-hand route is the official route. Our map shows an alternate route that goes down farther on scree and then comes around to the saddle. 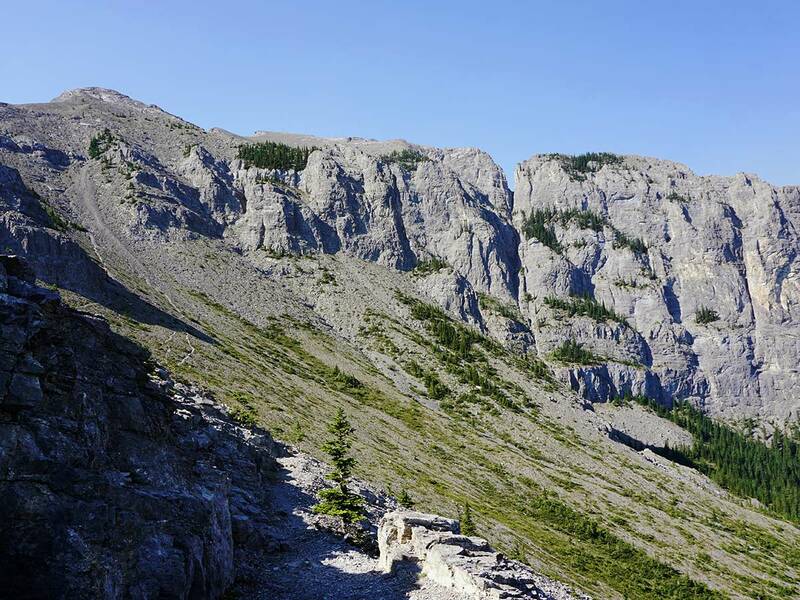 At the saddle you will need to head down and to the left, eventually going below the face of Mt Yamnuska. This path is steep and slippery to start, and poles are great here! When the path goes below the Yam cliffs it is very spectacular. Follow the obvious trail below the cliffs making sure to be aware for rockfall. As you go below the cliffs you will see paths going down the scree on your right. Don’t go down the first scree chute, but go partway across, looking for some nice scree that is deep with small pebbles. 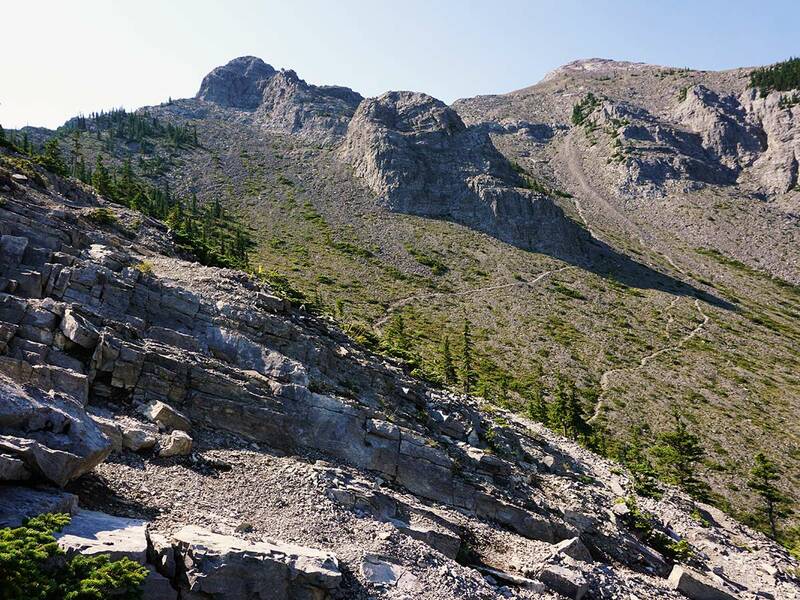 Carefully head down the scree and at the bottom go to your left on a clear path that goes through the trees. Follow the path through the trees until you see a sign you passed early on during the hike. Go straight and down and back to the car in 15 minutes. 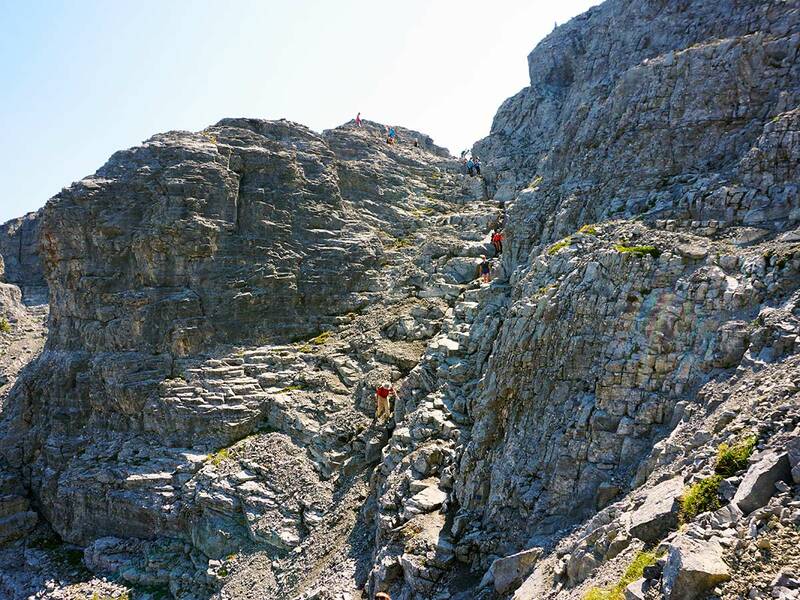 This is a hard hike, with challenges of getting through a rock seam, the chains, challenging ascending / descending on rocks and a steep scree downhill. Don’t do this until you are confident in your abilities. 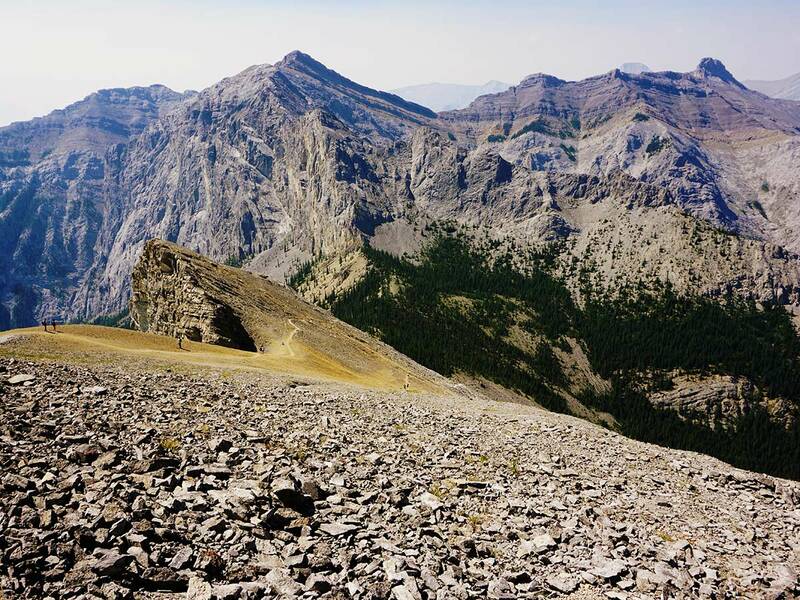 Consider a rock helmet for this hike, as there is a lot of rockfall. Stoney Nakoda Casino has some great meal deals after a hard day’s hike.  Consider returning to Calgary using the 1A. It’s a slower drive, but is much prettier than the Trans-Canada Hwy. 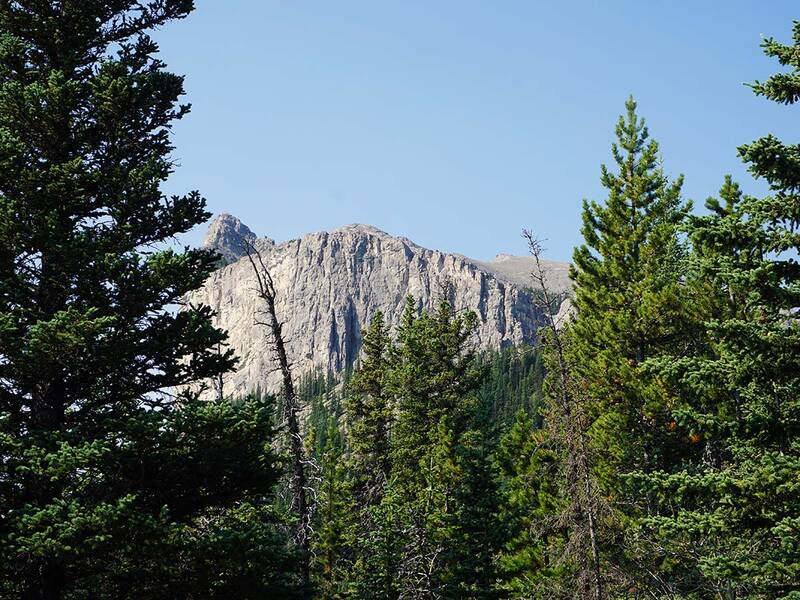 We rated this hike lower out of 10, simply because so many new hikers get overwhelmed on this hike!